Book a ferry to Copenhagen with AFerry. Ferries to Copenhagen, in Denmark, are available from Norway and Sweden. 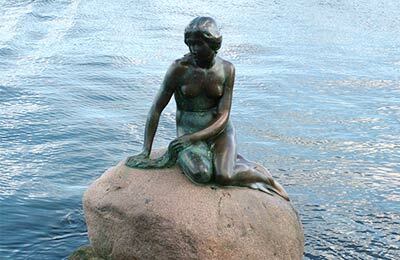 You can take a ferry to Copenhagen from Malmö and Oslo. Ferries to and from Copenhagen are operated by DFDS and Oresundbron. Because 2 ferry companies operate in and out of Copenhagen, comparing can be very useful to help you find the best price at the best time for you. When you search for a ferry to Copenhagen, we will always show a range of times just in case it's cheaper earlier or later than the time you select. We'll also show you results for similar ports like Frederikshavn, Grenaa and Helsingor to help you find the best times and prices to suit your plans. Copenhagen ferries with DFDS and Oresundbron are known for their comfort and high levels of service, and you will feel like your holiday has begun the moment you step on board. 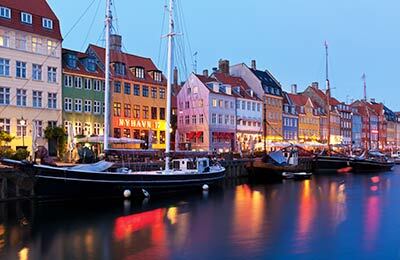 Travelling to Copenhagen will be easy and hassle free. Start by making your booking today, it's quick and easy. From the South: Drive down Kalvebod Brygge and Niels Juels Gade. Continue straight ahead to Kongens Nytorv and drive straight out of Bredgade and after that Gronningen. Turn right at Folke Bernadottes Allé (just before Osterbro train station) and drive straight out of Kalkbrænderihavnsgade until you turn right at Dampfærgevej. From the North: By car from north it is easy to find our new terminal. Drive straight out of Lyngbyvejen and turn left at Jagtvej. Then drive straight ahead on Strandboulevarden about 700m, and turn left at Århusgade for about 300m. Turn right at Kalkbrænderihavnsgade and drive straight ahead until you have to turn left at Dampfærgevej. Sometimes you think something is a good idea but it doesn't always turn out this way - travelling with DFDS Seaways Oslo to Copenhagen happily proved that this isn't always true. From booking to boarding to experiencing meals, shopping and sightseeing on board to disembarking, this is a great experience. If I was to change anything, I would have read the choices of rooms a little better and chosen to upgrade to a larger stateroom. Climbing into bunk beds at the age of seventy plus is a challenge! Fortunately, our room was on the embarkation and debarkation level so the crowded elevators were not an issue at those critical times. A good travel experience. Both journeys were ok, in general. The only thing is that our cabin from Oslo to Copenhagen had the sink's drain almost completely blocked (which was a bit annoying), and the shower soap bottle was empty. However, the cabin in the back trip was ok, with everything working well.